I know this is a really bad picture. I did make a couple of changes in the original recipe. I didn't have cucumber so I substituted some red on ion. It was delicious! The second change that I made was to marinate the chicken over night. I had originally planned to make it right away, but dh and the kids got home late and had already stopped for dinner on the way. If anything, I think the longer marinating time only helped this dish. It was delicious! This recipe comes from a great blog called Dinners for a Year and Beyond. It is the perfect place to spend half a morning browsing through delicious-sounding recipes and drool-inducing photos. 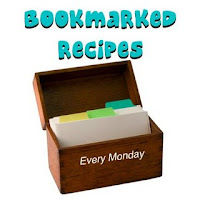 I think I found myself bookmarking about every other recipe! So far I've tried two recipes from Dinner for a Year and Beyond and loved them both. I blogged about the other one here. You should head on over and check out this wonderful blog for yourself! I will be submitting this one to the Bookmarked Recipes blogging event hosted this week by Ruth at Ruth's Kitchen Experiments. Be sure to check out all the great recipes that everyone tried out last week! In a small bowl, whisk together olive oil, balsamic vinegar, dried oregano, ground mustard, salt, and pepper. Place the chicken in a resealable bag and add about 3/4 cup of the vinaigrette. Seal bag and marinate chicken for 1 hour up to 4 hours. Heat a grill or grill pan to medium high. Remove the chicken from the vinaigrette and grill for about 5 - 6 minutes per side for the boneless breasts and 3 - 4 minutes per side for the tenderloins. Remove from grill/pan and cover with foil to keep warm. In a small bowl combine the tomato and cucumber and add the remaining 1/4 cup of vinaigrette. 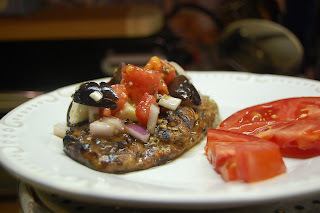 To serve, top grilled chicken with the tomato-cucumber mixture, a few olives, and some of the crumbled feta. This looks delicious. I've had a few incidents myself where the food's been eaten before the photos! Looks as though we have been paired for this months T & C event. We have something in common by loving "all things Greek"!!!!!! !I have browsed through your recipes and I must say you have made it very hard to choose just one dish:DWe are both members of the BB's as well!! I have never had any Greek food before, can't wait to try this recipe out !!! What are you talking about? Your photo looks great to me! So does this food! thanks for sending it into bookmarked recipes. Thanks for the compliments, and I am glad you like my recipes. I also find myself spending more time than I should bookmarking recipes. I will cooking nonstop for the next 100 years if I can ever get to them all.